U.S. Markets: U.S. stocks finished the week notably higher due to strong rallies on Wednesday and Thursday. In a widely expected move, the Federal Reserve decided to keep rates steady, but investors were cheered by an unexpectedly dovish post-meeting statement. The Dow Jones Industrial Average rose 326 points to close at 25,063—a gain of 1.3%. The technology-heavy NASDAQ Composite added 1.4% finishing the week at 7,263. 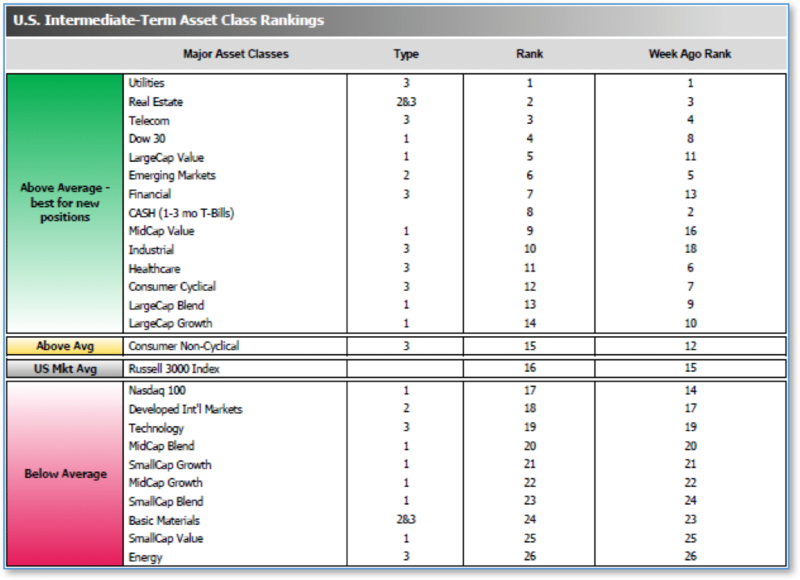 By market cap, the large cap S&P 500 rose 1.6%, while the mid cap S&P 400 and small cap Russell 2000 each rose 1.3%. International Markets: Canada’s TSX rose 0.9% for the week. Across the Atlantic, the United Kingdom’s FTSE retraced last week’s entire decline by finishing up 3.1%. On Europe’s mainland, however, major markets were mixed. France’s CAC 40 rose 1.9%, while Germany’s DAX ended down -0.9%. In Asia, China’s Shanghai Composite added 0.6% and Japan’s Nikkei ticked up 0.1%. As grouped by Morgan Stanley Capital International, emerging markets rose 1.3%, while developed markets gained 0.8%. January Summary: For the month of January, the Dow Jones Industrial Average and NASDAQ Composite smartly rose by 7.2% and 9.7% respectively. Smaller cap indexes outperformed their large cap peers as the S&P 400 and Russell 2000 shot up 10.4% and 11.2%, while the large cap S&P 500 gained a lesser but still robust 7.9%. Canada’s TSX surged 8.5%, but outside of North America major market gains were less robust. The United Kingdom’s FTSE rose 3.6%. France’s CAC 40 and Germany’s DAX added 5.5% and 5.8%, respectively. China’s Shanghai Composite rose 3.6% and Japan’s Nikkei gained 3.8%. Developed markets rebounded 6.6%, while emerging markets surged 10.3%. Gold and silver each gained 3.4%, while copper added 2.9%. However, the big story in commodities was in energy, where oil rallied 18.5%. Initial claims for new unemployment benefits surged by 53,000 last week to 253,000, far above the consensus of a 16,000 increase. It was the biggest jump and to the highest level since September 2017. 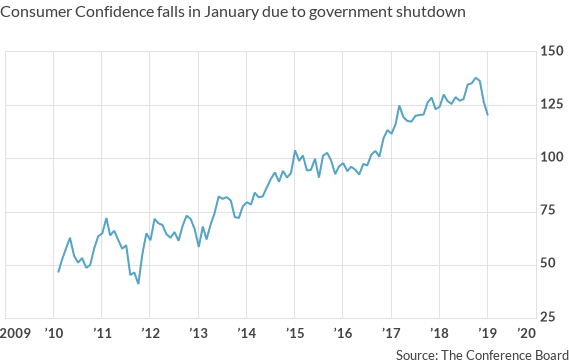 The number was likely influenced by filings from federal contractors and others impacted by the government shutdown. If this is the case, then initial claims should subside in the coming weeks. 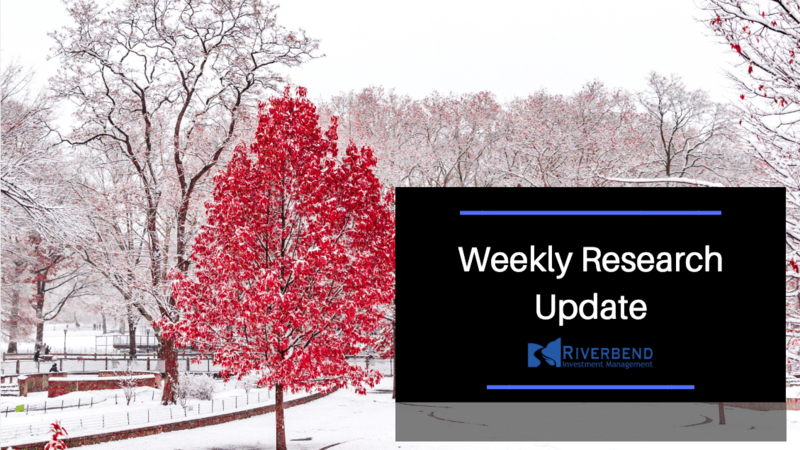 The four-week average of claims, used to reduce the short-term volatility, rose by 5,000 to 220,250. Thatnumber remains close to multi-decade lows and is consistent with tight labor market conditions. 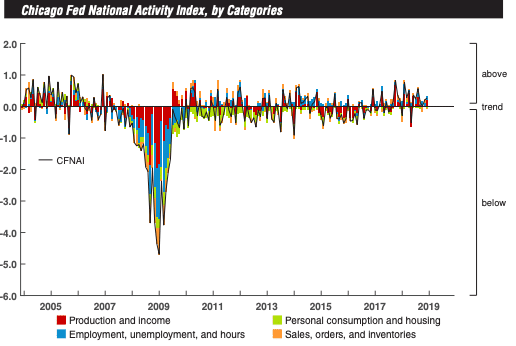 A broad measure of the U.S. economy, the Chicago Fed’s National Activity Index (CFNAI), was up slightly in December, but overall fourth quarter activity was notably weaker than the third. The CFNAI ticked up 0.06 points in December to 0.27, but the volatile nature of the monthly data puts emphasis on the index’s three-month average. The CFNAI’s three-month average increased 0.04 point to 0.16 in the final quarter of 2018, but that was down significantly from the Q3 average of 0.31. Factory-activity and employment-related indicators were responsible for much of the gain. The Chicago Fed index is a weighted average of 85 economic indicators, designed so that zero represents trend growth and a three-month average above 0.70 suggests an increasing likelihood of a period of sustained increasing inflation. 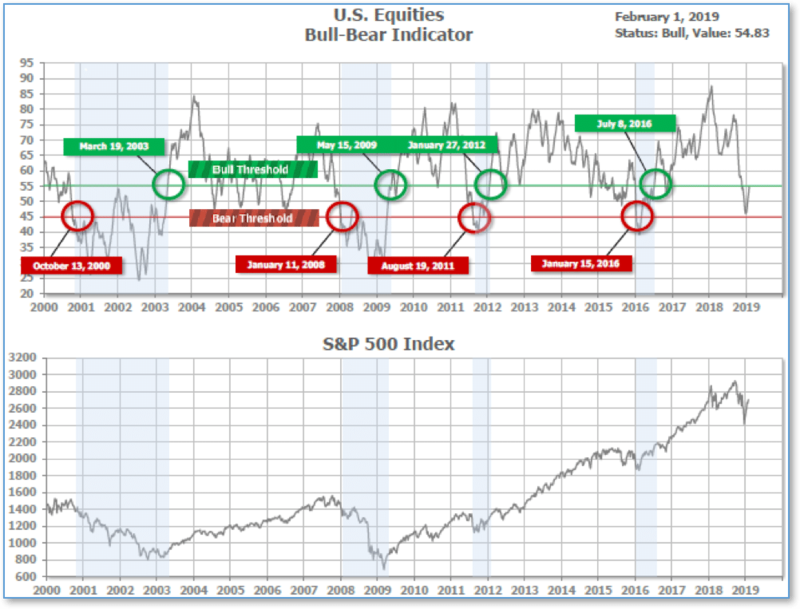 Forty-six of the 85 individual indicators made positive contributions in December, while 39 made negative contributions. 120.2—its third consecutive decline and its lowest level since July of 2017. 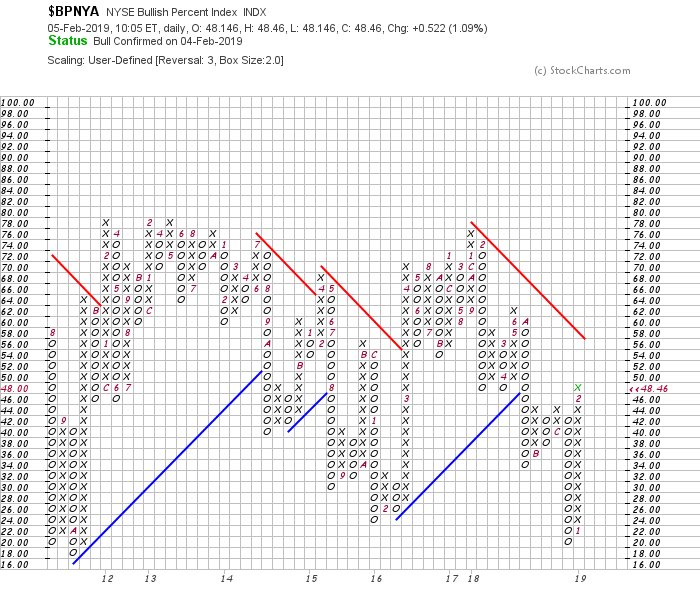 Expectations were for only a 4.1 point decline. While consumers’ attitudes towards their present situation remained steady, their expectations of the future plunged 10.4 points to 87.3—its lowest reading since October of 2016. Federal Reserve Chairman Jerome Powell thrilled markets this week when he said the case for higher interest rates “has weakened” because of muted inflation and somewhat slower economic growth and stressed that the central bank will be “patient” before determining its next move. The Fed also indicated it’s willing to adjust the size and scale of its balance-sheet runoff, and perhaps end it altogether. 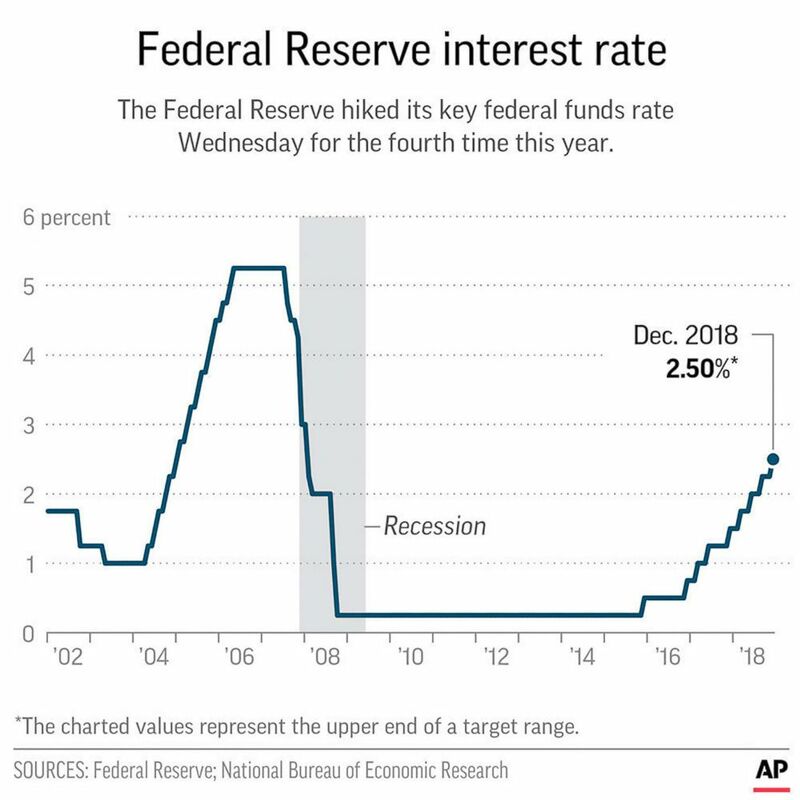 In a unanimous 10-0 vote, senior Fed officials left the key U.S. Fed Funds interest rate, unchanged stating that the current level of interest rates is “appropriate for the state of the economy”. The central bank also backed away from prior pledges for “further gradual increases” in interest rates — the first time since 2015 that the Fed’s statement has not included such language. The average ranking of Defensive SHUT sectors fell to 7.50 from the prior week’s 5.75, while the average ranking of Offensive DIME sectors rose to 18.00 from last week’s 18.50. The Defensive SHUT sectors lost a bit of their lead over Offensive DIME sectors. We’ve all heard and seen the advice given to young (and not so young) job-seekers: “Learn to code – that’s where the jobs are!” Coding (or, to use the more traditional term, “programming”) jobs in particular, and all “IT” jobs in general were supposed to be plentiful and going begging for qualified candidates. Except a funny thing has happened on the way to employment nirvana. Several months in the last year and now two months in a row, the “Information” industry segment has actually shrunk its employment while nearly all other industries are adding. 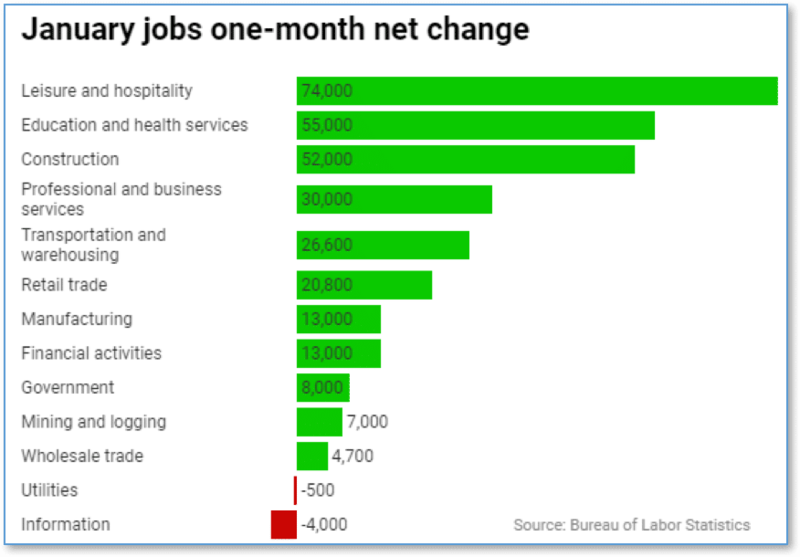 January’s “blowout” and “beyond all expectations” jobs number had one loser in it: a loss of 4,000 jobs in the “Information” industry.